You can purchase custom prints and custom greeting cards of selected paintings on paper or canvas in a wide variety of sizes and finishes to suit your decorating needs! If desired, you can also select from thousands of frames, mats, and wrap combinations and receive your fine art prints within one week! Click here to see the Prints that are available! 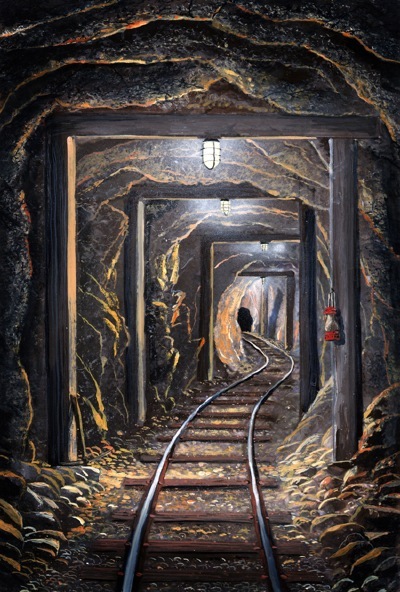 My mural, "Mine Shaft", was used as the front cover illustration of a middle school mystery novel, "Coyote-meeter's Abyss", by Robert L. Hunton that will be published in the summer of 2014 and is available at Open Books Press Direct, Barnes & Noble Booksellers, Amazon.com, and at all Independent Book stores. To license an image of a painting from my website for publication in print or web contact me for rates and licensing information. Numerous articles have been written about Frank Wilson's art in newspapers and magazines. He has been interviewed on public radio stations on both coasts and was a featured artist on ABC's nationally televised "GOOD MORNING AMERICA" show which aired October 9, 1998 after two days of taping in his Vermont Studio. Most recently he was on CBS News on Jan. 23, 2009 as seen below. The April 2010 Issue of Sacramento Talent Magazine is featuring Paradise, California artist Frank Wilson on it's front cover with an additional two page spread on pages 34 & 35. 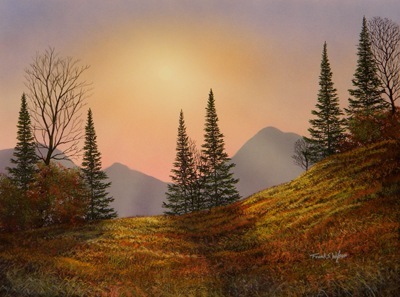 "Our featured cover artist of this month ~ Frank Wilson, is an artist of unmatched skills when it comes to picturizing nature with his brush and canvas." "A talented artist, Frank has transformed his paintings from being his profession to an independent medium of expression." Paradise resident Frank Wilson leads me toward the doorway of his walk-in closet for an artistic “magic trick.” The closet is huge: approximately 10 feet by 6 feet, neatly organized, its walls and ceiling painted a pleasing, flat white. “I invite you to please come in and close the door, then shut off the light,” he says very cordially, in his Boston accent. When I do so, a seemingly impossible scene comes to life in the pitch blackness. All four walls turn into an extremely realistic night sky—the kind one marvels at on the clearest of romantic, summer evenings. Stars by the thousands, of all sizes and groupings, adorn what was previously the plain white interior. Toward the far end of the ceiling a shooting star has left a green, foot-long trail. As three or four minutes pass, the four-foot-long Milky Way galaxy above, itself made of hundreds of stars, becomes clearer and clearer. “Each decade of age you are causes the eyes [to take] one more minute to see the details,” Wilson offers. This is one of Wilson’s “Night Illusions,” or “Glow Murals,” for which he uses special phosphorous paints and a secret technique that he acquired from a company called Starscapes F/X, which licenses hundreds of official “artist-illusionists” from around the world to install the paintings. A professional artist for 40 years, Wilson has painted his own glowing murals—which are exact replicas of the night sky—in many homes, resorts and hotels since 2000. As impressive as this format is, the 61-year-old Wilson is perhaps better known locally for his realistic, finely detailed nature settings, some with wild animals and the occasional human. He uses oils and watercolors on hardboard panels instead of canvas to create his paintings, some of which he says have sold for as much as $10,000. His works have been shown in five states, including the New York State Museum, and as far away as Zurich and Geneva, Switzerland, and he was even featured on ABC’s Good Morning America back in 1998. The most prominent acknowledgment of his skills was the invitation by his peers to be a member of the exclusive International Guild of Realism. Sitting with Toni, his wife of 40 years, in the living room of their immaculately decorated 2,000-square-foot home, Wilson talked about the notice. “I was shocked when I was accepted because that’s one of the most prestigious art guilds in the world,” he said. Opposite images are of a ceiling Miller painted at a Texas Holiday Inn Express demonstrating how the night sky, visible in the dark (right) disappears when the lights are on. Though Wilson is a life-long painter, he has the demeanor, dress and work ethic of a white-collar businessman. 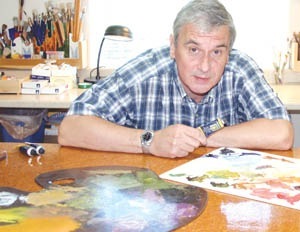 Since 1995, when he began cataloging his work by computer, Wilson has produced 2,900 paintings. Many are also sold reprinted in various formats, such as prints and greeting cards. He says he produces such high volume because painting is his full-time job. He also says that his wife is a huge help in all aspects of his business. For her part, in addition to helping with business matters and assisting him on projects, Toni says she even lets Frank know if a painting needs improvement. “I don’t want a painting to go out that doesn’t look right because I like it when the checks come in,” she says with a laugh. Wilson grew up in the Eastern U.S. and was inspired by a high school art teacher. He received his training at the Art Institute of Boston and moved to Paradise in 2002 after falling in love with the nature and weather here while visiting his son. “That was a huge career move for me, as I was well-established in the art community back East,” he said. In 2005, his “Mountain Moonglow” mural, featuring tall pines, won the people’s choice award for the 2005 Chico Open Board Art (COBA) project, and can be seen hanging downtown on the Third Street side of the building housing Katie’s Corner at Third and Main. Wilson also painted two murals on the outside of the new Enloe Hospital parking structure on Magnolia Avenue. Featured in the fall issue on page 22 of Northern California Spaces Magazine in a 'finishing touch' article is Northern California artist Frank Wilson. The article feature two of the artist's works one of which won first place in February 2010 in the Turner Color Works Of Japan International Gouache Painting Competition. 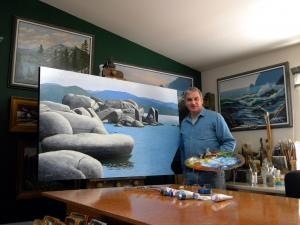 This award winning artist has been written up in many publications over his thirty nine year professional career. He has also been featured on on ABC's nationally televised "Good Morning America" show as well as on local California CBS television news stories. Wilson is available for custom painting commissions, mural both exterior and interior as well as his amazing illusions that can only be seen in total darkness. Frank Wilson is represented by the following fine art galleries. 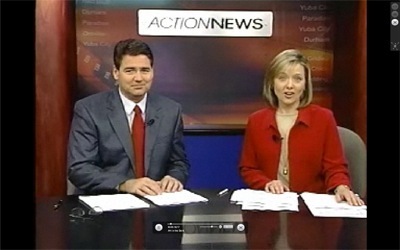 Frank Wilson and his wife were the subject of a news story on CBS's KHSL TV in Chico, California. "Art In The Dark" was a news story reported by: Nitin Lal, CBS Action News that aired on January 23 rd & 24th 2009. AUGUST 2007 After a review of Frank Wilson's artwork and résumé, the prestigious "International Guild Of Realism" has invited Frank to become a member which he has accepted. The "International Guild Of Realism" is an organization who's mission is to advance realism in fine art through museum exhibitions, art gallery shows, workshops, education programs, marketing support and Internet exposure. Visit the web site for the"International Guild Of Realism" at; http://www.realismguild.com The artists are listed alphabetically on the web site. By contrast, “Moonlight Hike” represents one of Wilson’s “memory pictures” from a five-hour hike on the Pacific Crest Trail near Beldon Town. “Just a short way up the path I came upon spectacular views. As I walked, I thought about color combinations, such as combining cobalt and alizarin for shadows, and I considered how to balance triangular trees, winding paths and curving mountains. When I got back to my studio I knew exactly what I wanted to do. I’ve been developing a photographic memory for decades. That’s especially essential for nocturnes that can’t be painted on location because of dim light.” Examples of Wilson’s “landscape portraits” as well as “landscape memory paintings” are now on display at Avenue 9 Gallery in Chico. I asked Wilson how, in his opinion, the current recession was affecting art. He commented: “Throughout the country, many fine art galleries have closed their doors, while others are struggling to stay afloat. The withdrawal of funds for public school art departments will have sorry consequences for decades as generations grow up with a lack of art appreciation that will affect their quality of life. New England transplant finds plenty of artistic inspiration in Paradise. The life canvases of many artists are awash with boldly colored lifestyles, living quarters and wardrobes. But that doesn’t necessarily make them great artists. Paradise painter Frank Wilson, a neatly groomed fellow with a tidy home and nary a spot of paint on his carpeted home studio floor, channels all of his dazzle into his works. And by all reasonable measures, he is a great artist. Wilson, who named Thomas Hill and Maxfield Parrish his greatest influences, is a gifted realist—he’s even a card-carrying member of the International Guild of Realism. His bold colors and sharp lines not only re-create Mother Nature’s dazzling vistas, but also instantly demand attention, and respect, from the viewer. For more than 35 years, the Boston-born artist has put brush to canvas on thousands of works. An avid hiker and cross-country skier, especially at night, the 59-year-old Wilson has a special affinity for painting nocturnal landscapes, such as “Mountain Moonglow,” a Pacific Crest Trail-inspired work that won the Chico Open Board Art (COBA) People’s Choice Award in 2005. “There’s something so magical about getting up in the high country at night,” Wilson said in his unmistakable New England accent. 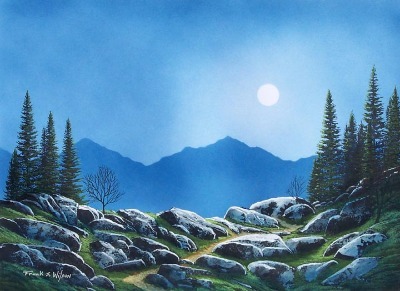 “When your eyes get acclimated to a full moon, it’s like high noon.” The son of a renowned sculptor, Wilson began his lifelong artistic journey in high school, where a zealous teacher inspired him to submit what turned into a blue-ribbon entry in an all-New England scholastic art competition. All through his tenure at the Art Institute of Boston, Wilson continued his association with the instructor, soaking up artistic skills, theory and business advice that he said proved more profound than lessons learned at the Art Institute. Now Wilson presides over what could be considered a small empire of art (he frames and mattes his pieces, and is also a talented muralist). Even after four decades in the business, he retains a childlike fascination with his craft. “It’s been a lifelong passion,” he said. “What’s not to love about being an artist? Before I get to the kitchen for my coffee, I’m at work.” Wilson began exhibiting his work as soon as he completed school in 1971, and a few years later set up shop—and home—in the tiny idyllic village of East Topsham, Vt. Wilson’s reputation, and ego no doubt, got a big boost in October 1998, when a TV crew from ABC’s Good Morning America came to town to film a feature about painting New England autumn foliage. Wilson’s son Adam settled in Paradise 12 years ago, eventually drawing Mom and Dad to build a house in the area and come west in 2002. “We came out to see him and fell in love with Paradise,” Wilson said. “We got tired of 40-below weather.” Ever since, Wilson has taken advantage of this region’s natural beauty, creating series that illustrate places such as the Sutter Buttes, Lake Tahoe, Feather Falls, Table Mountain and the Mendocino Coast. Wilson was recently tagged as an archivist when The Doiron Gallery in Sacramento called a Wilson exhibit “California Landscapes—A Preservationist’s View.” “It was the first time I was ever labeled that way,” Wilson said. “I never thought of myself like that—until the fires.” Wilson, who evacuated his home twice in two months due to the local fires, has found a new worth to his works. 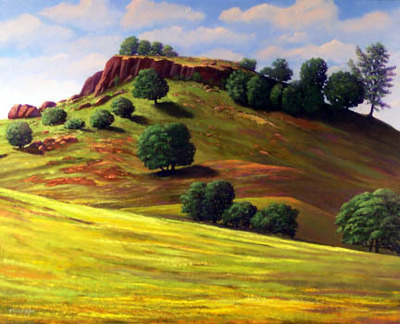 A 2007 series of paintings that show the vibrant beauty of the wildflowers and native bluffs and buttes as viewed from Durham Pentz Road are now a testament of how the landscape looked before it was badly scorched. 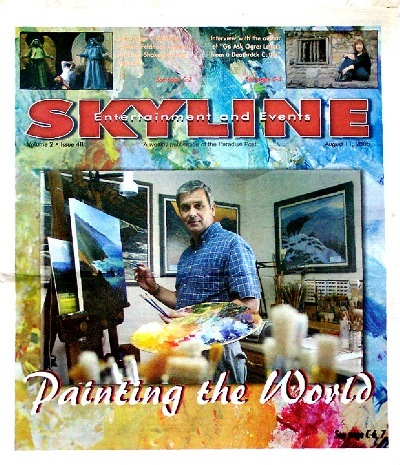 This is the cover of the Skyline weekly magazine which is published every Thursday by the Paradise Post in Paradise, California. Wilson was featured in the centerfold two page spread that follows. The colorful graphic that forms the border is a close-up photograph of one of his working pallettes. Two page centerfold article in the Skyline Magazine August 11, 2005 published by the Paradise Post. Paradise California. Thursday April 13, 2006 article in the Paradise Post. 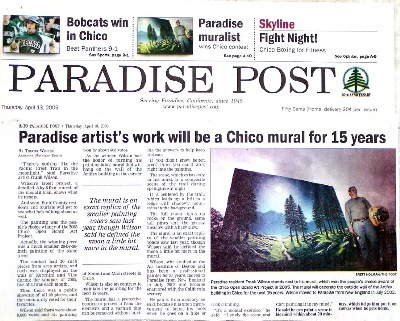 Newspaper article details the artist, Frank Wilson, winning the 2005 COBA (Chico Outdoor Board Art) mural competition in Northern California. Article in "Guide To The Arts" magazine which cover the arts in Northern California. Featured artist in Directory of Galleries in Guide to the Arts page 71 published by Aardvark Publications in the winter 2005 edition. Featured with several other artists in a sponsorship page for the California State University's "Guide to Performaces" at Laxon Auditorium, Chico CA campus. 2006 season. 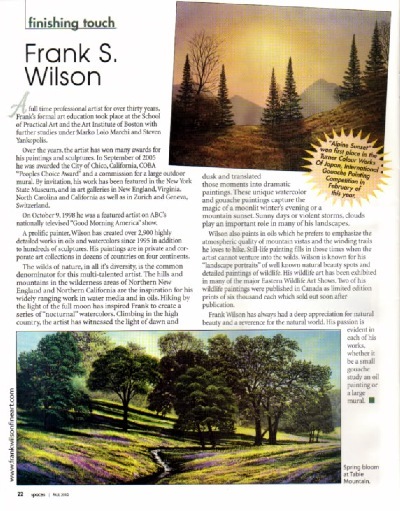 Watauga Democrat June 16, 2005 newpaper article in Boone, North Carolina about Frank Wilson's oil paintings series of a local attraction, Grand-Father Mountain, featured at Gallery Alta Vista in Valle Crucis, NC. Paradise Post Skyline Thursday October 23, 2003 Local Spotlight Artist Of the Week. Paradise Post, Saturday, July 17th 2004 Painting featured "FOUR PEARS IN BLUE BOWL"
Sunday Eagle Times that serves the Twin State Valley between Vermont and New Hampshire. Sunday December 9th, 2001 Front page article on a special, month long exhibit entitled "Moonlight In Vermont" featuring the nocturnal works of Frank Wilson in oils watercolors and ceramic tile. This article was continued with more pictures and text on page A16 as shown below. This is a continuation of the front page article shown above. Windsor Chronicle Windsor Vermont Thursday December 6, 2001. More articles will be forthcoming as I go through my archives and scan the articles.